Earlier today, I spent about 2 hours in Kinokuniya KLCC browsing some books that I deem important in assisting my day-to-day chore at the office. At first, after reading glaring reviews from many, I opted to buy Tim Harford's Adapt. He is famous for his previous book entitled Undercover Economist and some even labelled him as the "Malcolm Gladwell of UK." I am not a big fan of those two writers as I consider them "populist" kind of scholars (which I don't think they labeled themselves as such) but I found out that Harford's latest offering just fit my bill nicely when it comes to providing interesting anecdotes and case studies on the need to innovate and adapt to current environment be it in business world or any other else that matters to civilized people at large. Furthermore, Kinokuniya is offering 20% discount for that book, hence the enticement was great. All the good feeling went to the abyss after I read a very critical review from a blog called Whimsley. Although it is not a full-fledge review of Harford's, the blogger wrote one of the most interesting debunking of "pop" economics book that many perceived to be "innocent" and "benign" - in contrast to normal perception by many against left-leaning so-called "ideological" economic books that are pretty much critical against the dominant, positivistic economic school of thought of modern day - neoliberalism. I was so impressed by his argument and indeed he managed to convince me to re-consinder my intention of owning Harford's latest work. Talking about brilliant intellectual persuasion. It made me realised that how Harford, Gladwell, De Bono and many others who have written and produced "best-seller" kind of "science" and "self-help" books were actually applying many erroneous logical analysis that sometimes end up making their argument looks like a silly and patchy piece of reasoning - as brilliantly exposé by Whimsley earlier. Whimsley's lucid rebuttal reminded me of the many of Prof. Al-Attas and his students way of writing refutations (radd) that most often than not were written in solid and coherent manner. From the cover and subtitle, it pretty much reminded me of Toxic Sludge is Good For You! which unfortunately, I'd lost it way back during my final year at the university. 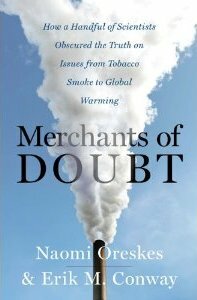 But on second thought, I was actually not attracted to the subtitle, what more the issue of climate change (which I think has pretty much become a cliche now days) but it was the word "MERCHANT" and "DOUBT" that attracted me the most. With regard to the word merchant, what conjures instantly upon my mind is Shakespeare's classic Merchant of Venice and also another interesting book about the book publishing industry that yet still not under my possession - Merchant of Culture. But the word "merchant" itself, without any qualifier or adjective will not bring any benefit to my inquisitive soul vis-à-vis the word "doubt" that was emphasized the greatest on the book cover. Of course I am not expecting the book to be a straight-edge philosophy kind of writing but after browsing it for half-an hour, it gave me an enlightening perspective upon the issue being raised by the two authors whom both are accomplished historian of science - Prof. Naomi Oreskes and Erik Conway. The book despite carrying "technical" issues with respect to the scientific debate on global warming is pretty much heavily embedded with "philosophical" underpinnings such as epistemology, logic, and reasoning that touch upon the scientific, economic and environmental issues that are still surrounding the current climate change debate. You can read the reviews here in order to appreciate my comments better. Alas, the real surprise that I had earlier from that book was pretty much an interesting one. I think that book could perfectly fits within the modern dialectic discourse of "separating the truth from the falsehood"- or in Islamic science term, al-kalam al-jadid/ al-'asr (The New Kalam or Kalam of the Age). The book shows vivid examples how scientist, journalist, philosopher and even laymen could trace the concept of "doubt" that has been uplifted as part of their system and tools in charting their scientific, business and morale paradigm in this debate on climate change. Ideally, this book could serve as a good model for budding scientists, engineers, economists and many others who wants to apply and operationalize the spirit of Al-Ghazali's Tahafut al-Falasifah and Al-Attas' exposition on the worldview of Islam in dealing with modern scientific discourse like this issue on climate change whether it is man made or natural occurrence. For me it seems the book managed to capture the spirit of classics such as Rachel Carson's Silent Spring and E.F Schumacher's Small is Beautiful in building up solid cases purging out evidences from the debate that lead to subsequent rebuttal. Paradoxically, despite of myself promoting this book in this entry, I did not buy it yet as I think more free time is needed for me to savor it properly and systematically. So I only bought latest edition of Ode magazine, Paul Feyerabend's Conquest of Abundance: A Tale of Abstraction versus the Richness of Being and Dietrich Dörner's Die Logik des Misslingems (The Logic of Failure: Recognizing and Avoiding Error in Complex Situations). Perhaps later, once I finish Dörner's. Mohon diberikan ruang untuk menyampaikan berita baik ini! Bersih 2.0: Merakam Semangat Zaman/Capturing The Spirit Of The Times – Pertandingan Menulis Esei dan Cereka di dalam Bahasa Malaysia dan Bahasa Inggeris. Lebih daripada RM6,000.00 untuk dimenangi + buku-buku + tshirt diskopi super kool edisi terhad + peluang untuk karya anda diterbitkan di dalam bentuk buku! Anda boleh juga download poster pertandingan menulis esei dan cereka ini dalam jpeg file dan meletakkannya kat blog, website atau facebook anda supaya kawan-kawan anda yang lain juga tahu tentang peluang baik ini. Tolong war-warkan tentang pertandingan ini kepada jaringan dan kawan-kawan anda yang kat online mahu pun offline. Quo Vadis "Universiti Teknologi Petroleum"?